Although his rise to the Russian presidency was marred by allegations that he was simply a puppet of former President Vladimir Putin, Dmitri Medvedev has shown a few signs of branching out on his own. In a meeting with U.S. President Barack Obama in Europe this week, he agreed to arms-control talks in order to cut weapons stockpiles and prevent the spread of nukes to Iran and North Korea. The talks are to be followed by another meeting between the two leaders in July. "We have considerably more positions that bring us together than those that force us apart," he noted, marking a new sense of possibility between the two countries. Still, Prime Minister Putin's influence over Medvedev remains solid, as exhibited by the military force Medvedev used against separatists in the former Soviet Republic of Georgia last August.  The 43-year-old was born on Sept. 14, 1965, in Leningrad (now known as St. Petersburg), the only child of two university professors.  In 1987 he graduated with a law degree from Leningrad State University. He remained at the institution to complete a doctorate in private, corporate and securities law and taught civil law concurrently.  Founded two major companies, one dealing with paper-processing. The nature of the other business is unknown. 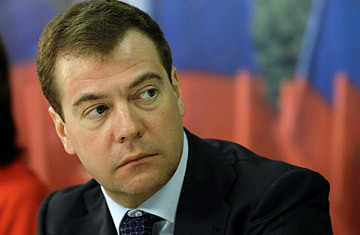 Medvedev is also the author of several legal textbooks.  First Russian leader in decades with no known links to either the former Soviet Communist Party or its secret services. He is also the country's youngest head of state since Nicholas II became czar in 1894.  From 2000 to 2008, he served on the board of the state-controlled firm Gazprom, Russia's largest company and the world's largest extractor of natural gas. The company has frequently become embroiled in payment disputes with Ukraine, which relies on Gazprom for its gas supply.  Won the presidential election on March 2, 2008, with about 70% of the vote, even though he refused to debate rival candidates or formally campaign.  Last September, Medvedev became the first Russian leader to visit the Mask of Sorrow, a memorial to the millions of people who died in the Soviet gulags.  He and his wife Svetlana have a son, Ilya, born in 1996.  "Hard rock. From back in my school days ... Black Sabbath, Led Zeppelin and Deep Purple."  "We are well aware that no nondemocratic state has ever become truly prosperous for one simple reason: freedom is better than nonfreedom."  "We are not asking anyone to love Russia, but we will not allow anyone to cause harm to Russia and we will get respect  for the citizens of Russia and for our whole country, but not with force but by our own behavior and successes."  "I have a legal mindset which has pluses and minuses. The advantage is that it enables one to properly formulate aims and helps with decision taking. The disadvantage is that often I speak and explain myself more precisely than is needed. And from this there arises the feeling that before you stands a dry man buttoned up to the neck."  "We are ready to take any decision [from NATO], up to halting relations altogether."  "We have the chance to form a stable government after the elections in March 2008. And not just a stable government, but one that will carry out the course that has brought results for all of the past eight years."  "Medvedev's personality was shaped under Putin's strong influence, and he worships Putin like a father figure, or at least like an older brother." "Putin and Medvedev are customers in a restaurant. After Putin orders a steak, the waiter asks him, "And the vegetable?" Putin responds: "He'll have steak too."